This award-winning one-woman play, accompanied by live music written and performed by Yuval Ron, follows an American archeologist's journey to discover the truth about an artifact in Israel that could have transformational implications for Israel, the Middle East and the world. Sponsored by the Y&S Nazarian Center for Israel Studies and the Dortort Center for the Arts at Hillel at UCLA. Co-sponsored by the UCLA Department of Theater and the UCLA Alan D. Leve Center for Jewish Studies. 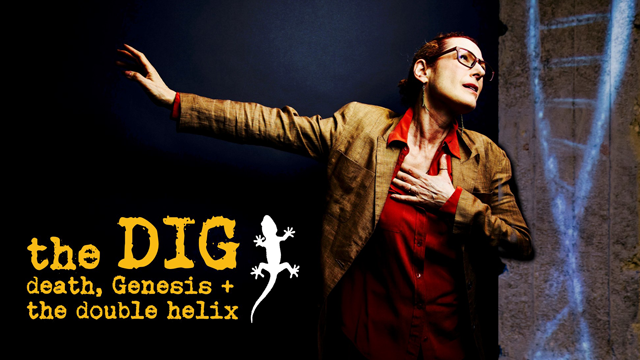 In The DIG, playwright and actor Stacie Chaiken plays Sally Jenkins, an American archaeologist renowned worldwide for her ability to extract genetic information from ancient bones. In the performance, Sally is summoned to a dig in Jaffa where the Israelis have discovered something they fear might topple the precarious political, historical and religious balance in the region. Sally is the only person in the world who can tell them what it is. Her partners in this adventure are Israeli antiquities operative, David, Arab-Israeli expert in text and artifacts, Rashid, and Mo, the lizard she finds in the bathtub in her suite in a five-star hotel. Based on Sally’s findings - scientific and otherwise - she, David and Rashid together make a choice that is uncharacteristic, possibly reprehensible, and certainly transformational. The DIG seamlessly traverses the worlds of archaeology; science and biochemistry; Biblical text; Jewish history and identity; the history/story of the land of Israel Palestine; modern Israeli culture; ethics; genetics; epigenetics; mother-daughter meshugas (craziness); the Holocaust and generational trauma - in the realm of families and nations and peoples. Following the performance will be a conversation with playwright Stacie Chaiken and UCLA Professor Aaron Burke of the Department of Near Eastern Languages and Cultures and co-director of the Jaffa Cultural Heritage Project (JCHP), an interdisciplinary cultural heritage project that addresses the history and archaeology of Jaffa. Stacie Chaiken is a writer-performer and the principal creative force behind The DIG, the world premiere of which was produced at Los Angeles Theatre Center by Jose Luis Valenzuela and the Latino Theater Company. The Los Angeles-based Chaiken's work has included a variety of solo performances as well as leadership of several devised-theatre projects with diverse communities, including immigrants, recovering drug addicts, LGBTQ youth, interfaith youth and Orthodox women. Her current work includes consultation and leadership of other creative projects in Los Angeles, including acting as Story Consultant for New Ground: a Muslim-Jewish Partnership for Change and as facilitator of story workshops for the organization's fellows. A Fulbright Senior Specialist in the field of Performance and Story, she was formerly on the performance faculty of the University of Southern California School of Dramatic Arts. Yuval Ron is an internationally renowned and award-winning World Music artist, composer, and record producer. In addition to his leadership of The Yuval Ron Ensemble music and dance group, Ron has created scores for a number of plays, television series and films, including the Oscar-winning short West Bank Story. His music is influenced by his continual research into various ethnic musical traditions and spiritual paths. This research has included producing field recordings in the Sinai Desert with the Bedouins, archival preservation recordings of the sacred Yemenite, Moroccan and Andalusian Jewish traditions, and the album of a famed Sufi master musician, Omar Faruk Tekbilek. Ron's musical achievements have been recognized with a a variety of awards and grants from the National Endowment for the Arts, American Composers Forum, California Council for the Humanities and the Rockefeller Foundation. Pamela Berlin is a New York-based theater director. Her credits include dozens of plays in New York and across the Northeast and Canada as well as several operas. She has participated in the Sundance Playwrights Institute, Chautauqua, Theatreworks Palo Alto, Cape Cod Theatre Project and the New York Theatre Workshop Dartmouth Summer Residency. She taught directing in the MFA program at the Mason Gross School of the Arts at Rutgers University for twelve years, acting in the MFA program at ﻿Brooklyn College, and freq﻿uently directs at Juilliard and the NYU Graduate Acting Program. She is a long time member of the Ensemble Studio Theatre and served as the President of the Society of Stage Directors and Choreographers from 2000 to 2006. ﻿Berlin received her BA in American History and Literature from Harvard University and her MFA in Directing from Southern Methodist University. Tim Labor is an award-winning Professor in the Department of Media and Cultural Studies at the University of California, Riverside who specializes in music composition and sound design for theater and film. Prof. Labor's pre-recorded score for the 2016 premiere production of The DIG at the Los Angeles Theatre Center helped earn the production a nomination for the 2017 Los Angeles Stage Raw Theatre Award for Sound and Projection Design. As a film and media composer, Labor has collaborated in composition or sound design for a variety of projects, including computer games, video, dance, and theatre and has been recognized for his work with a number of prestigious awards in Southern California and internationally.